Registration is $15 per person and includes lunch. Registration is available in person at the Cathedral and online here. Doors open at 9:00 am for coffee and conversation and the program begins at 10:00 am. All are invited to Wholehearted Worship on Saturday, February 23, a day featuring the work of Dr. Brené Brown and premiering the How2charist: Digital Instructed Eucharist video. The Rev. 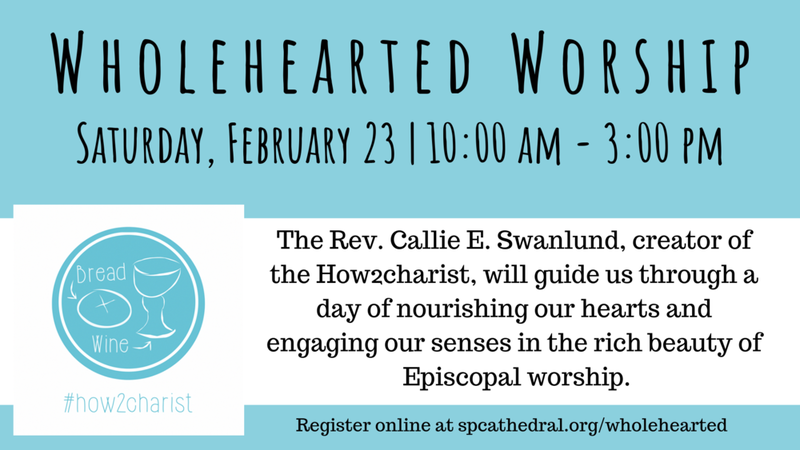 Callie E. Swanlund, creator of the How2charist and a certified Daring Way facilitator, will guide us through a day of nourishing our hearts and engaging our senses in the rich beauty of Episcopal worship. How2charist is a film that deepens our experience of the liturgy and invites others into the Episcopal Church. The Daring Way follows the work of Dr. Brené Brown on vulnerability and courage. Callie will combine these to help us reflect on who we are called to be as beloved children created in the image of God, and how that affects our engagement in the Eucharist and other elements of Episcopal life. The day includes lunch and Eucharist. This event is strongly recommended for anyone seeking confirmation this spring, as well as everyone who wants to know more about the Episcopal Church and why we do what we do.